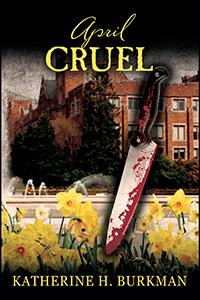 Katherine H. Burkman’s “April Cruel.” Professor Erica Berne discovers that her fiancé has been murdered. A detective and two young professors attempt to uncover the perpetrator. Since Professor Berne has so many grudges against her, there are motives aplenty. Has she so offended other students and teachers that they have decided to eliminate her? Why are the people on campus in fear?